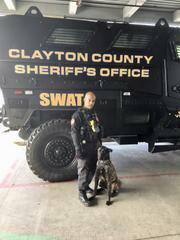 Rescued Dog Now A Drug And Patrol K-9 For Clayton County SHERIFF VICTOR HILL! The Clayton County Sheriff’s Office newest K-9 named Jack was found after someone threw him from a moving vehicle in North Georgia. Jack, now a 16 month old Dutch Shepard, was rescued by an unknown person who observed this animal abuse and took him to a nearby shelter. The Hiwatari Kennel later adopted Jack when they observed that he had the ability to do police work. When Jack was tested, he passed all areas of the process with flying colors and stood out showing great drive and will power to do the job. The Hiwatari Kennel kindly donated Jack to the Sheriff’s Office to replace the loss of K-9 Ares who was laid to rest back in November. Ironically, K-9 Jack has a striking resemblance to late K-9 Ares and will have the same handler (Johnson) who has just been promoted to Sargeant and serves as a member of the elite S.R.T. (Scorpion Response Team) for the jail. On 01/19/2019, K-9 Jack was appointed and deputized by Clayton County Sheriff Victor Hill to serve as a member of the Sheriff's Office. K-9 Jack will be tasked with patrolling Georgia’s toughest para-military jail better known as the “Hill-ton”.